We have a wide range of accessories to compliment any kit. 5 Alarm Leather's rope bag attachment ring features heavy duty 2” latigo leather, heavy duty snaps, and a 2”stainless steel D-Ring. This attachment is designed to be compatible with our truck belts to secure your personal rope bag. This accessory is available in black or burgundy leather with silver or brass hardware. 5 Alarm Leather's flashlight ring features heavy-duty 2” latigo leather, heavy duty snaps, and 2” stainless steel ring. 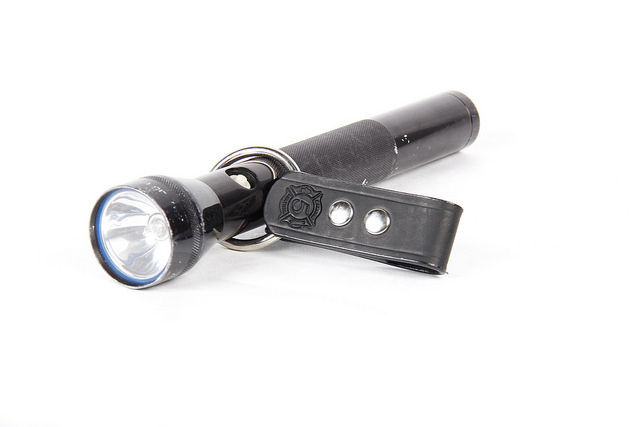 This attachment is designed to be compatible with our truck belts to secure your streamlight (or similar flashlights). This accessory is available in black or burgundy leather with silver or brass hardware. 5 Alarm Leather's boxlight strap features our heavy-duty 1 ½’ or 2” latigo leather, heavy-duty snaps, and heavy-duty quick release plastic buckle. This attachment is designed to be compatible with our truck belts to secure and to carry your boxlights hands free. This accessory is available in black or burgundy leather with silver or brass hardware. 5 Alarm Leather's anti sway keeper features our heavy-duty latigo leather, and heavy-duty hardware. This product is designed to be paired with our radio straps to keep your radio from a free-swinging action and keeps the radio close to the body. This accessory is available in black or burgundy leather with silver or brass hardware. EMBOSSING is available for letters and numbers only up to 3 characters ½” stamp. Symbols are not available for embossing on this product at this time. 5 Alarm Leather's cord keepers features our heavy duty 1 1/2" latigo leather and heavy duty snap. This accessory is designed to securely attach your microphone cord to your leather radio strap. This product is sold in sets of 2, below are the different options for leather color and hardware.